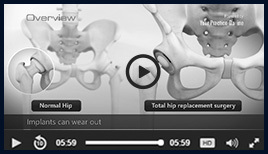 At a young age of 56, I had to have both of my hips replaced due to hip dysplasia. I choose Dr. Azzam, and I feel BLESSED ! 2017 turned out to alleviate all pain in both my hips, Thank You Dr. Azzam for your well honed skills as a surgeon. I hope many seek your talents. You can be proud of a job well done.